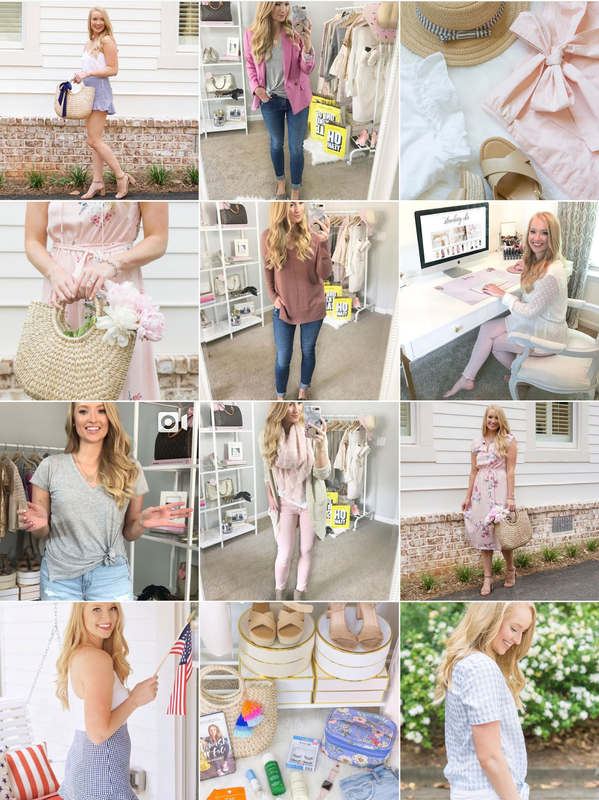 I didn’t realize until I went through and categorized my older posts that I haven’t been doing regular Instagram Roundups, so I wanted to bring them back to the blog! Here is what I’ve been up to throughout June and July. You can click the picture to go to the original post on Instagram. 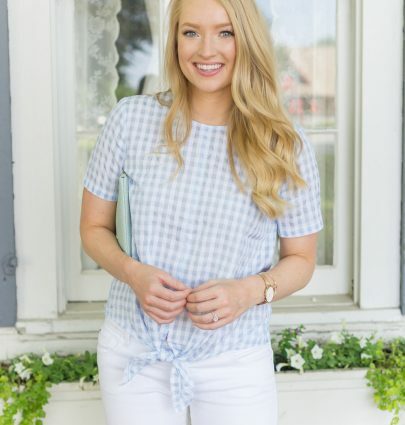 I love classic gingham print, but I was so happy to find it in this fun light blue color from Madewell! I’ve worn this top a lot throughout June and July. The back has buttons so it’s easy to pull over your head without getting makeup on it. You can check out the full outfit post here. Also, I’m usually always wearing hidden crown hair extensions in my posts, you can read my review about them on the blog. 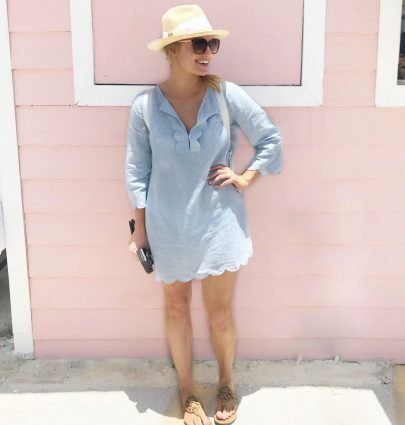 Another Madewell top I’ve been loving throughout summer. This one was found on the sale rack! I actually don’t shop there too often, but after my last trip I see what I’ve been missing out on. My shorts are also from Madewell, and I love how high waist they are. You can see the full outfit post here. I never thought I would see the day when I posted a photo of me online, by myself, in a bikini, lol. But apparently 3 layers of spray tan gave me the confidence to do so 😉 I had to do some major bathing suit shopping before a cruise in June, and I love all the pieces I picked up! I love the scalloped detail on this swim coverup! I was torn on getting a pink or blue, but I’m happy I decided to get the light blue. This photo was taken in Freeport, Bahamas on our first day on the cruise. We had so much fun at Taino beach. I can do a full post on our cruise experience if you’ve like to see what we did! You can see how I edited this photo in on the blog. 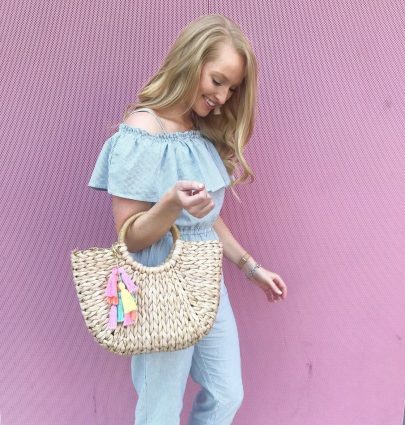 I wore this jumpsuit to a Spring blogger event at Lenox Mall. 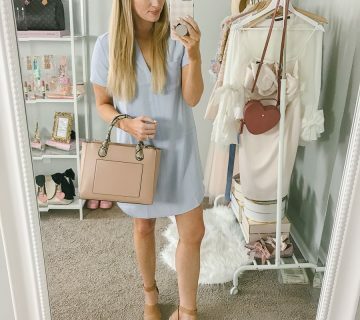 It took me a while to get on the romper bandwagon, and the same applied to jumpsuits. But now, I’m obsessed with them! I think they’re so chic, plus they make getting ready easy. 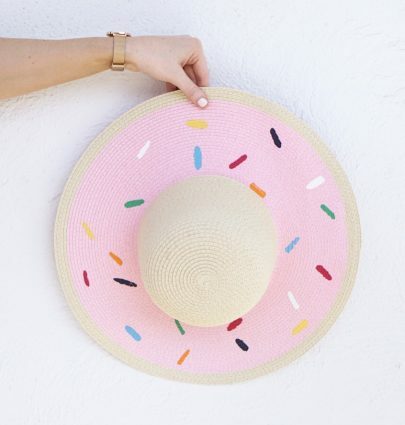 My beloved donut hat got a little misshaped on the cruise. I was lazy with packing it between trips to the beach and folded it up! I thought about trying to make a new one myself. Would you want to see a DIY?? I think it would be super easy! This pair of tie-waist shorts makes me so happy. I own them in two colors! 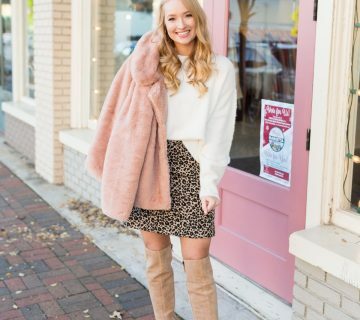 You can see the brighter pink pair in this outfit post. The side zips up so you don’t have to worry about un-tying the waist if you don’t want to. The white ruffle tee-shirt adds more personality to your outfit. Mine is from Target but I linked a similar option below. 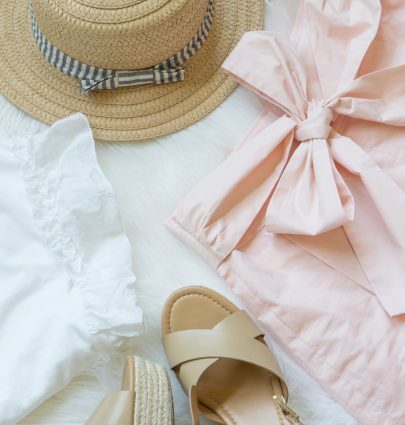 These espadrilles are a great buy under $100 if you’re looking for a comfortable, modest heel. J. Crew shoes usually run small for me. 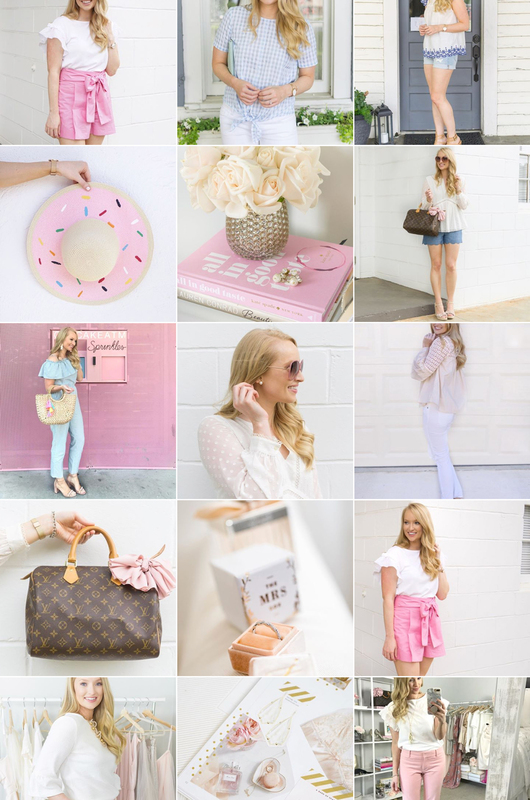 I think this was my most liked photo of the month, people love pink on my feed! 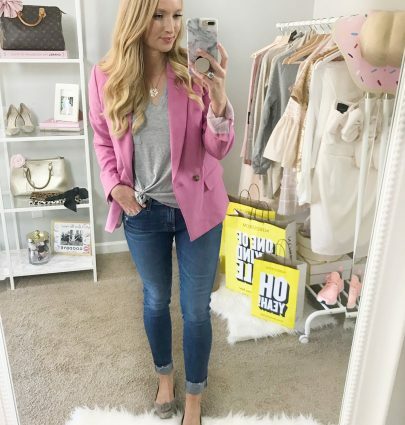 To read a full review on this blazer, head to my Nordstrom Anniversary Sale Try On post. If you’re wondering how I tied my top, I have a super easy video on my IG that is way easier than you think! Plus, it doesn’t stretch out your tops as much. My Minnie flat is a work favorite, I may pick up a second pair. The Revas are my least favorite flat and have always hurt my feet, but these were comfortable right out of the box. This is my first midi dress. 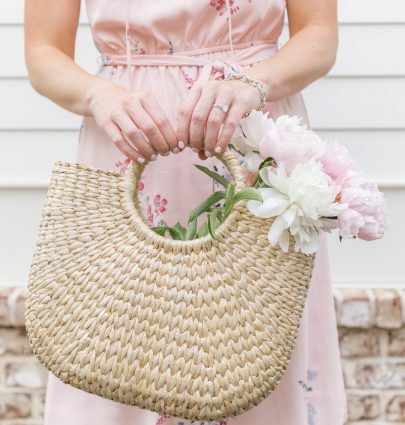 I love the soft pink and floral print! A full outfit post with some of my favorite Loft sale picks will be up later this week. I’ve used this clutch all throughout summer (read more about it in my June Favorites + Fails). I got a lot of questions from Atlanta girls asking where I bought the peonies… they’re from Trader Joes! Same bag, tied with a bow! For this look, I was hoping to find a red bow in my gift wrap stash to tie in the red lipstick but had to use a navy one instead. My shorts were a Zara find that I can’t link, but there are similar options I’m linking here if you can’t find these at Zara. My heels are obviously a favorite mentioned a few times here on the blog. For $25 they’re a no-brainer! A few sizes are sold out, but they keep restocking them so fingers crossed you can get a pair! Another look from my NSALE haul. 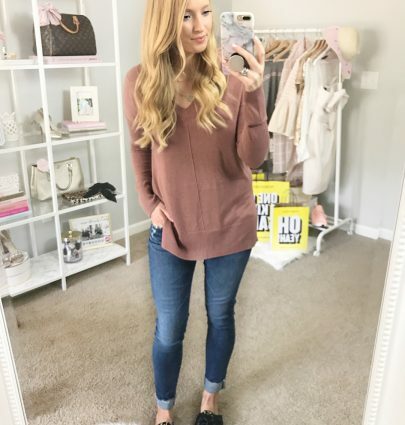 This is definitely my favorite sweater from the sale! I love the deep orange color, especially paired with leopard print. I ended up returning these shoes because they were a little loud for my style. I’m still on the hunt for a good leopard shoe that doesn’t intimidate me! 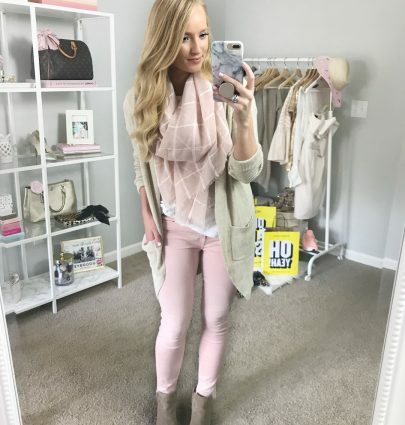 This is my favorite look from the Nordstrom Anniversary Sale because of the soft neutrals and pink hues. I returned this BP cardigan because it’s too similar to one I have from last year in the sale. I may end up returning the jeans if I can find a dupe for less. I will let you know if I do!